This is the first blog of a three blog series. 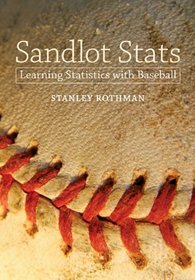 This blog will give the reasons I use for making my MLB predictions for a new year. The second and third blogs will give my actual predictions for the three division winners and two wild card teams in each league for the 2017 season. To recap the 2016 season these were the final standings. The three division winners in the AL were BOS, CLE, and TEX. The two wild card winners were TOR and BAL. The three division winners in the NL were WSN, CHC, and LAD. The two wild cards were NYM and SFG. My Linear Formula for the 2016 season was W% = .000579*(Runs Scored – Runs Allowed) + .50 where W% was a team’s expected winning percentage based on their (runs scored – runs allowed). Using the expected winning percentage from my formula the following would have been the final standings for 2016. From my formula the three division winners in the AL would have been BOS, CLE, and SEA. The two wild card winners would have been TOR and BAL. 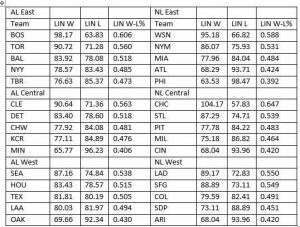 The three division winners for the NL would have been WSN, CHC, and LAD. The two NL wild card winners would have been SFG and STL. 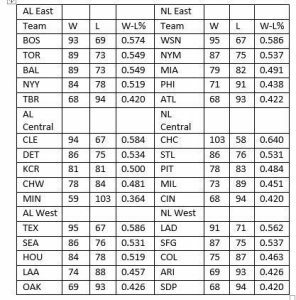 The only difference in the five playoff teams, comparing the actual playoff teams to my expected playoff teams from my formula, was for the AL TEX made it and SEA did not and for the NL the NYM were in and STL was out. The reason for giving the above data is to justify why I use my formula to help me make my predictions for next year’s playoff teams based on how the runs scored and runs allowed for each team will change from the previous year. These changes in runs scored and runs allowed are estimated by looking at the new players added and the old players deleted from each team. From the addition and subtraction of players for each team I estimate a new runs scored and runs allowed for each team. Then using my Linear Formula, I arrive at a team’s estimated winning percentage for the new season. My next two blogs will give my predictions for the two leagues for the 2017 season. By the way using my method last year I predicted the CHC would defeat TOR in the World Series. Of course, even though TOR made the playoffs it was CLE that represented the AL in the World Series.